When I first read all of Sir Arthur Conan Doyle's Sherlock Holmes stories, having found them collected in full (not, of course, including last year's "lost" story) in two old volumes at an antique store, I understood immediately why they'd so quickly become so popular with their first readership in the late 19th and early 20th centuries. Or rather, I should say that I felt it--that perfect alignment of form and substance that only comes along in popular art every few decades. The very first voice it presents is Doyle's own, speaking briefly on Holmes and spiritualism, which gives us time to settle in for a five-part rendition of the very first in the Holmes canon (and thanks to "more female interest than is usual," one of Doyle's personal favorites), "A Scandal in Bohemia." It comes performed by Sir John Gielgud and Sir Ralph Richardson, two of the most respected actors in 20th-century British theater. We've previously featured their portrayals, Gielgud's of Holmes and Richardson's of Watson (and we can hardly neglect to mention the one and only Orson Welles', of Moriarty), on the New Adventures of Sherlock Holmes radio drama. But this playlist provides a wealth of other voices from various eras interpreting Doyle's most beloved works as well, a variety that certainly suits its protagonist, the most-portrayed literary character of all time — which means that, unlike the collected print canon of Sherlock Holmes adventures (that "lost" story and its mysterious authorship aside), the collected audio adventures of Sherlock Holmes will only grow longer and longer, so those who want to listen to them all had best get on the case without delay. You can find this playlist added to our collection, 1,000 Free Audio Books: Download Great Books for Free. 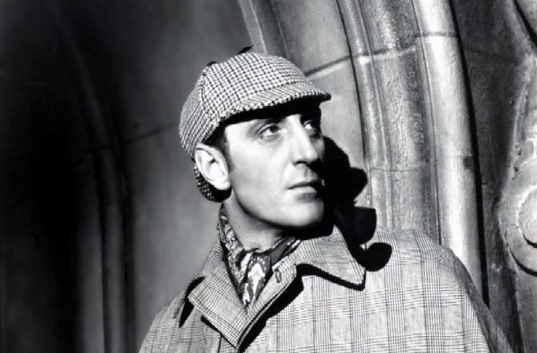 Also find Sherlock Holmes stories in our other collection, 800 Free eBooks for iPad, Kindle & Other Devices.